Not to be confused with Army of Islam (Gaza Strip). Not to be confused with Islamic Army in Iraq. Jaysh al-Islam (Arabic: جيش الإسلام‎‎, meaning Army of Islam), formerly known as Liwa al-Islam or the Brigade of Islam, is a coalition of Islamist and Salafist units involved in the Syrian Civil War. Its primary base of operations has been the Damascus area, particularly the neighbourhoods of Douma and Eastern Ghouta. Jaysh al-Islam is the largest rebel faction in the area, as was its predecessor. The group was a part of the Islamic Front. The organization has rejected membership of the Free Syrian Army. The group along with Ahrar ash-Sham are the main rebel groups supported by Turkey and Saudi Arabia. The group aims to create an Islamic state under Sharia law. Syria, Russia, Iran, and Egypt have designated Jaysh al-Islam as a terrorist organization. Liwa al-Islam was established by Zahran Alloush, the son of Saudi-based religious scholar Abdullah Mohammed Alloush, after Syrian authorities released him from prison in mid-2011 where he had been serving time for his Salafist activism. The group claimed responsibility for carrying out the July 2012 Damascus bombing that killed Defense Minister Dawoud Rajiha, Deputy Defense Minister Asef Shawkat, and Assistant Vice President Hassan Turkmani. Liwa al-Islam was a driving force behind actions in the Damascus region. It cooperated and conducted joint operations with the Al-Nusra Front. On 29 September 2013, 50 rebel factions operating mostly around Damascus announced they were merging into a new group called Jaysh al-Islam. Liwa al-Islam was the dominant faction in this merger, and its leader Zahran Alloush was announced as the leader of Jaysh al-Islam. Thirty-eight of the original groups listed as joining the merger were already members of, or affiliated with, Liwa al Islam. By November 2013, 60 groups had merged into Jaysh al-Islam, and more than 175 rebel groups around Syria expressed a desire to join it. The new group's creation was said to have been negotiated and spearheaded by Saudi Arabia, who believed that the Al-Nusra Front was gaining too much strength. After the merger, The Guardian reported that Saudi Arabia was preparing to give the group millions of dollars to "arm and train" its fighters, and use instructors from Pakistan to help train the group. Jaysh al-Islam has criticized the Syrian National Coalition, stating that the group should be led by those who are fighting in Syria rather than leaders in exile. On 26 April 2015, along with other major Aleppo based groups, they established the Fatah Halab joint operations room. The Islamic Front criticized ISIS (Islamic State of Iraq and the Levant), saying: "They killed the people of Islam and leave the idol worshippers" and "They use the verses talking about the disbelievers and implement it on the Muslims". Jaysh al-Islam released a video[when?] showing the execution of ISIS members and showed a Jaysh al-Islam sharia official condemning ISIS as "Khawarij" (deviating from mainstream Islam). In 2013, Alloush gave a speech attacking the Shi'ites, whom he called "Rafidis", the Alawites and "the Zoroastrians", saying "the mujahideen of the Levant will cleanse the Levant of the filth of Rafidis and Rafidism, they will cleanse it for ever God willing, till they will cleanse the land of the Levant of the filth of the Fireworshippers who fought the religion of God Almighty", "the Shi'a are still despicable and pitiful through history", "And I give you the news, oh filthy Rafidis: Just as the Umayyads crushed your heads in the past, the people of Ghouta and the Levant will crush them soon, they will make you taste a painful torment in this world, before God makes you taste it in the hereafter". Alloush has denounced democracy and called for an Islamic state to succeed Assad, however in a May 2015 interview with McClatchy journalists, Alloush used moderate rhetoric, claiming that Syrians should decide what sort of state they wanted to live under and that Alawites were “part of the Syrian people” and only those with blood on their hands should be held accountable. His spokesman went on to claim that the sectarian and Islamist rhetoric Alloush had previously made was only intended for internal consumption and to rally his fighters. On 6 October 2012, Liwa al-Islam captured two 9K33 Osa SAM systems in Eastern Ghouta with at least 12 missiles total. A video was posted on 29 July 2013, with it being used to shoot down a Syrian Mil Mi-8. In November 2013, the group captured two training-jets (L-39s used by the government as jet fighters) from the Syrian Air Force and showed them on the runway. But so far, they haven't been used in combat. On 30 June 2015, Jaysh al-Islam's website published a 20-minute video that showed its fighters executing 18 alleged ISIL militants by shotgun. The video mimics the imagery that ISIL has used for similar filmed executions; however, it reversed the imagery by having the executioners wearing orange prisoner outfits and the victims being dressed in black robes. The video, which included some English subtitles, stated the killings were in revenge for recent beheadings of captured Jaysh al-Islam fighters by ISIL. In August and September, 2015, Jaysh al-Islam shelled and stormed Adra Prison. As of September 12, 2015, it had taken control of two buildings. On November 1, 2015, an opposition media outlet, Shaam News Network, posted a video showing Jaysh al-Islam militants had locked people in cages and spread out 100 cages containing 7 captives through Eastern Ghouta, northeast of Damascus, to use them as human shields against Syrian government air raids. According to the Syrian Observatory for Human Rights, the caged people being used as human shields were captured Alawite military officers and their families who had been kidnapped by Jaish al-Islam two years ago outside Adra al-Ummaliyah, a government-held neighbourhood in Eastern Ghouta. On December 25, 2015, the group's founder Zahran Alloush was killed, along with several other leaders of the group, in a Syrian air strike on the suburbs of Damascus. Abu Hammam Bouwaidani succeeded him as leader. 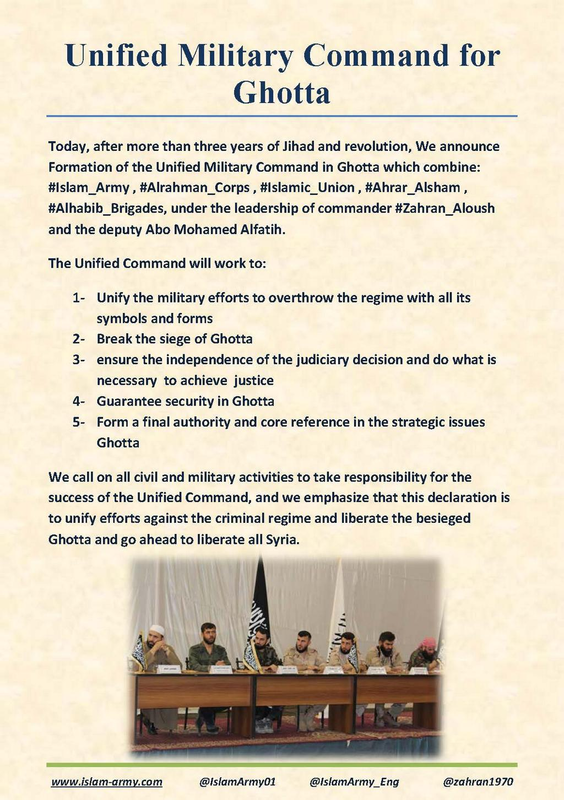 Since the death of Zahran Alloush there have been conflicts between Jaysh al-Islam and other members of the Unified Military Command of Eastern Ghouta, along with associated groups such as Al-Nusra Front and it's Jaish Al-Fustat operations room. Ahrar ash-Sham have remained neutral. On 24th May 2016 leaders of Jaysh al-Islam & al-Rahman Legion met to sign a peace deal to end hostilities. On April 8, 2016, a spokesman for the rebel group admitted that “forbidden” weapons had been used against Kurdish militia and civilians in Aleppo. He stated that “One of our commanders has unlawfully used a type of weapon that is not included in our list”. He did not specify what substances were used but, according to Red Crescent, the symptoms are consistent with the use of chlorine gas. Welat Memo, a physician with the Kurdish Red Crescent said that the people affected are "vomiting and having difficulty in breathing." ↑ Liwa al-Islam and her 9K33 Osa 31 July 2013. Retrieved 27 December 2013. ↑ Video of 9K33 Osa shooting down SAF helicopter. Retrieved 27 December 2013. This page was last modified on 25 May 2016, at 08:58.